The following software are behind many of the powerful and useful capabilities of DETERLab. For information on other tools that may be useful to DETERLab users, see DETERLab Tools. 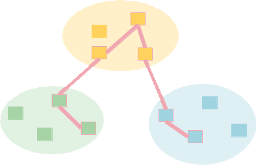 The Containers system enables experimenters to create large-scale DETER topologies that support differing degrees of fidelity in individual elements. In order to create an experiment larger than the 400+ computers in DETER, experimenters must use virtualization, simulation, or some other abstraction to represent their topology. The container system guides this process allowing experimenters to create large experimental environments that can be used to gather correct results. The mailReader DASHBoard after deciding, via the rational module, not to follow a URL. DASH agents, available on DETERLab nodes, are intended to simulate human behavior in a variety of situations in DETER and other environments where group decision-making is mediated by computers. For example, they have been used to model observed behavior in responding to phishing email, downloading and using security software such as Tor or making decisions to control a power plant. The DETER federation architecture is a model and mechanism for creating experiments that span multiple testbeds. This subsystem allows a researcher to construct experiments that span testbeds by dynamically acquiring resources from other testbeds and configuring them into a single experiment. As closely as possible that experiment will mimic a single DETERLab experiment. Federation is used with our scalable authorization system, Attribute-Based Access Control (ABAC). MAGI is DETERLab's communications and control system for repeatable experimentation. This workflow management system provides deterministic control over the various components in an experiment. It is used as part of the DETERLab workflow to express and automate the procedure of an experiment. MAGI enables deterministic orchestration of event streams, repeatable enactment of procedure, and provides control and data management for experiments.